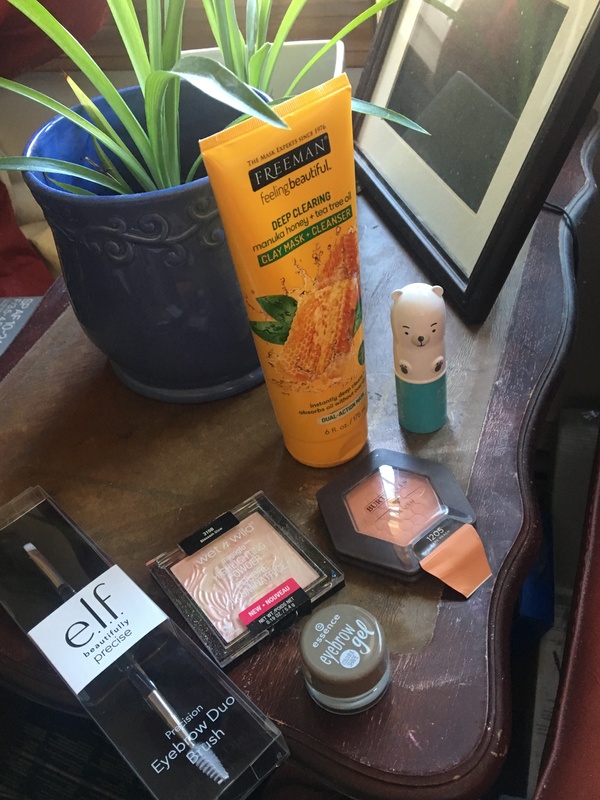 I went to Ulta the other day and picked up some things so I thought I’d share my thoughts with you! This is a collective haul with mini reviews. Freeman Manuka Honey + Tea Tree Oil Clay Mask + Cleanser – I did not like this mask at all. If claims you can also use it as a cleanser, but I didn’t use it that way. It says to use it for 3-5 minutes, which is a very short amount of time to use a mask. It was very creamy and took some time after.I applied it to dry down and didn’t down completely. I didn’t notice my skin feeling softer or clearer after using it, and immediately after using it I got a large zit! My skin also felt very stiff. Overall I didn’t notice any positive benefits from the masks and I wouldn’t recommend it. The Saem Iceland Hydrating Eye Stick – This was from CVS but I thought I’d throw it in bere because I bought it around the same time. It doesn’t come with much product (when I rolled it up a little that was all that was in there) but it is very cooling on the eye and it’s absolutely adorable! (Mostly why I bought it). Burt’s Bees Blush Makeup in Bare Peach – This was also from CVS. This is the prettiest and easiest to use natural-looking blush. The pigmentation was just the righ amount and the texture was very soft, plus the color was the perfect natural medium pink-peach looking blush. Wet n’ Wild Mega Glow Highlighting Powder in Blossom Glow – I have one other Wet n’ Wild highlighter but in a shade that was a little too deep for me (it was the last one there so I grabbed it up!) The formula reminds me a little bit of the MAC Extra Dimension Skinfinishes and is absolutely stunning and has a metallic glow. This lighter shade really stands out on my medium complexion but isn’t too light for me. Plus it was about $5 – you definitely can’t go wrong with the Wet n’ Wild highlighters. Essence Eyebrow Gel in Blonde – This is an extremely inexpensive brow pomade and I could definitely tell it was more inexpensive from the texture. It was a little bit more dry and not very pigmented at all – if I use this is in the future it might be in addition to a pencil, and definitely not by itself. The color was extremely ashy and almost grey, so almost too cool-toned to use in the future despite the fact I dye my hair blonde. ELF Beautifully Precise Eyebrow Duo Brush – I bought this to replace my angled brush from Sigma I lost (wait to see my post coming up on brushs I’m replacing!) It was a little bit flimsy but it did the job, and I appreciated that it came with a spoolie on the end. Physicians Formula The Healthy Foundation SPF 20 – This foundation came with a huge doe foot applicator (similar to the Taste Shape Tape and the Clinique Beyond Perfecting Foundation + Concealer except that the tip on this one is more pointed). It had medium-to-full coverage that was slightly dewy but I wasn’t comfortable using it just by itself for a full day so I layered it with the Fenty Pro Filr Soft Matte foundation. Together it lasted well all day. I’d use the combination again, or use it on a more no-makeup makeup kind of day where I’m okay with lighter coverage. It did also however leave a pretty finish on the skin. Physician’s Formula Butter Bronzer in Bronzer – I’ve heard so much hype about this bronzer and they had Buy 1 Get 1 50% off on Physician’s Formula so I grabbed it. It smells tropical and delicious just like everyone says but it wasn’t too overpowering. It went on evenly and had good pigmentation and made my skin looked subtly more bronzed and defined. I’m looking forward to using this one more. Japonesque Brush Cleanser in Rosewater Sce- I’ve been using the Japonesque Parian Spirit Brush Cleanser to spot clean my brushes for ages and it finally ran out a few days ago. The formula hasn’t changed on this one and the rosewater scent smells fresh and clean. It cleans off my eyeshadow brush in seconds and left it dry, soft, and smelling lightly of roses. Gets an A+ from me. L’oreal Lash Paradise Mascara in Waterproof – If you know me and my blog for awhile you’ll know that the L’oreal Lash Paradise mascara is one of my favorite mascaras. This was a re-purchase, I think this is probably the third time I’ve purchased this mascara since it came out. It gives the most beautiful effect to the lashes that is very volumizing and slightly lengthening, that holds a curl, and doesn’t budge all day. I highly recommend checking out this mascara. Japonesque High Density Foundation Brush – Small – I did not like this brush. I think if you’re okay with less coverage it might be a nice buffing brush for foundation, but I found it soaked up too much foundation in the process of putting it on and I ended up using more than usual. I don’t like to do too many returns on this things I’ve used but I may end up bringing this one back and I might even re-purchase a long time old-school product, the Sigma F80, instead. That one doesn’t soak up product and gives a great, beautiful finish. That or my Wet ‘n Wild Flat Top brush if I can find it, because that’s affordable and also a great flat top kabuki brush for foundation.